The market for cases that protect your smartphone is huge--as in $2.2 billion worth of huge, if you believe the numbers put out by market research firm NPD Group. Even if that number seems a little high to you, just a glance around at all the people holding all the phones should be enough to convince you that there's money to be made from churning out cases. Apple’s iPhone 5c Case covers the back and sides of its new phone, leaving the screen exposed. I think Apple made that calculation, too: People are making money off of iPhone cases. Why aren't we? And that's how you wind up with the iPhone 5c Case, a $29 add-on produced specifically by Apple for its iPhone 5c smartphone. That probably sounds like a pretty cynical rationale for a product from Apple, given the company's well-earned reputation for thoughtfully designed, elegantly produced products. That's because the iPhone 5c Case is unlike other Apple offerings: It fails to meet the standard of what you'd expect from similar products, let alone something out of Cupertino. Let's start with what's good about the iPhone 5c Case, or with at least what's perfectly acceptable. It's a silicone cover that slips over your 5c, protecting the back and sides while leaving the screen exposed. A small ridge ringing the front of the phone keeps the screen from coming into contact with surfaces, giving your phone a fighting chance of survival should it ever get a cruel lesson about gravity's pull. Microfiber lining inside the case keeps your 5c from getting scuffed up. Won't covering up your 5c hide one of its most appealing assets--its eye-popping color? 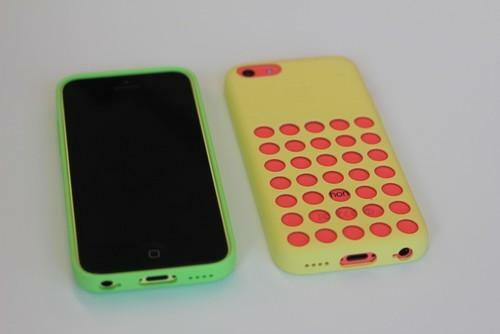 Sort of, but Apple's solution is to make the iPhone 5c Case colorful in its own right. The case is available in six colors--the pink, yellow, blue, green, or white colors of the iPhone 5c itself, plus a black version. That's 30 different color combinations by Apple's math, assuming you buy all five phones and all six cases and are a weirdo. Anyhow, there's a lot of different ways to get the mix of color you prefer. I love the colors of the 5c, but for some reason, on a silicone case, those colors don't pop the way they do on the phone. The case colors have a more muted feel, at least to my eye. Maybe it's because polycarbonate has a sheen that silicone doesn't. Whatever the reason, I find the case doesn't quite match the iPhone 5c for visual zing. A phone case should not tear after less than a week of use—especially not one made by Apple. Apple has another way to let the 5c's true colors shine through--holes. A lot of them. 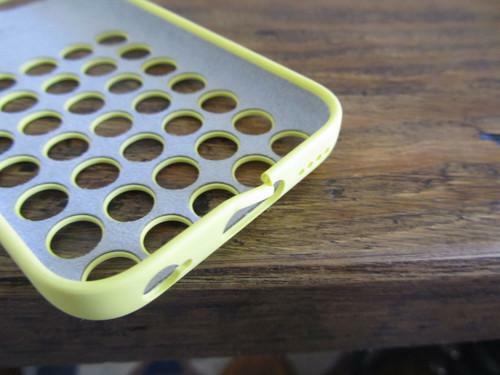 A seven-by-five grid of holes adorns the back of the iPhone 5c Case, with the idea that they'll give you a glimpse of the color that lies beneath. They also give you a glimpse of some of the writing on the iPhone's back--some letters, but not others--and the look isn't very pleasing. And those holes seem like they'll let in the kind of dust and dirt I'm hoping to keep outside by using a case. It might have been better if Apple had just opted for a solid backing and left its holes on the drawing board. I have one other complaint with the iPhone 5c Case, particular to my own experience with it. After a few days of use, I noticed the little strip of silicone that surrounds the Lightning port looked a little distended, maybe after a few too many times of slipping the phone in and out of the case. When trying to push that strip of silicone back into place, it snapped, leaving me with a torn iPhone 5c Case after just a few days of not particularly tortuous use. I can't speak to Apple's manufacturing process with the iPhone 5c Case--it's very possible that the vast majority of cases can stand up to repeated use. All I know is that the one I tested did not. The market for iPhone cases is so vast that surely more than few will emerge that will be a fitting accessory for your 5c. Apple's offering isn't among them.